I went out to my physiotherapy appointment this morning in a tank top, jeans, and a sweater. It was like a vision of the spring to come, and it’s pretty much unbelievable. This is Alberta in January, usually a long, dark, month of brittle cold, and here we are with bright blue skies and above-freezing temperatures for the fifth day in a row. Please don’t think I’m complaining about the beautiful weather. I’m just at a loss for what to say. I’m used to wearing wool socks and long johns to venture out of my house this time of year, but lately I’ve been bombing around town in sneakers and a hoodie. The downside: Sherm farts like mad while he runs, even indoors. There are times he sounds like a dirtbike. Summer 2011 was rainy and grey, and winter 2011 was the coldest, snowiest one I can remember, so maybe this very mild winter is Mother Nature’s apology for last year’s suffering. It’s rather like the neighbour buying you flowers after backing her Subaru through your fence. I’d like to think this gorgeous weather is all about striking a balance, because the last thing I want to experience, meteorologically speaking, is all the icky parts of the winter we were scheduled for crammed into the nest eight or ten weeks. Imagine that? It would be the equivalent of eating an entire week’s worth of hospital meals in a single sitting: positively gag inducing. Yuck. The “heat” and sunshine are forecast for a few more days at least, so we’re going to soak it up as long as possible. At the very least, I should have an easier time than I normally do chipping the turd nuggets out of the back yard. Southern Ontario is experiencing the same weather, kinda feels like we’re going from winter into spring. I know! I’m just worried that winter will come back to get us when we should be having spring. Is it an El Nino year? It was 75 here today Kay. I has been such a mild winter so far in South east Virginia. However, that being said, our winter down here waaaay in the south (as compared to you geographically) is always more mild than yours. According to the Farmers Almanac, all of this gorgeous weather will abandon us in February and we will get LOTS of snow. We shall see…..
Lots of snow? That sounds horrible, especially in the waaaaay south! I don’t mind the cold of winter, but I truly hate driving when the road conditions are bad. Maybe we’ll all just luck out and skip winter this year? 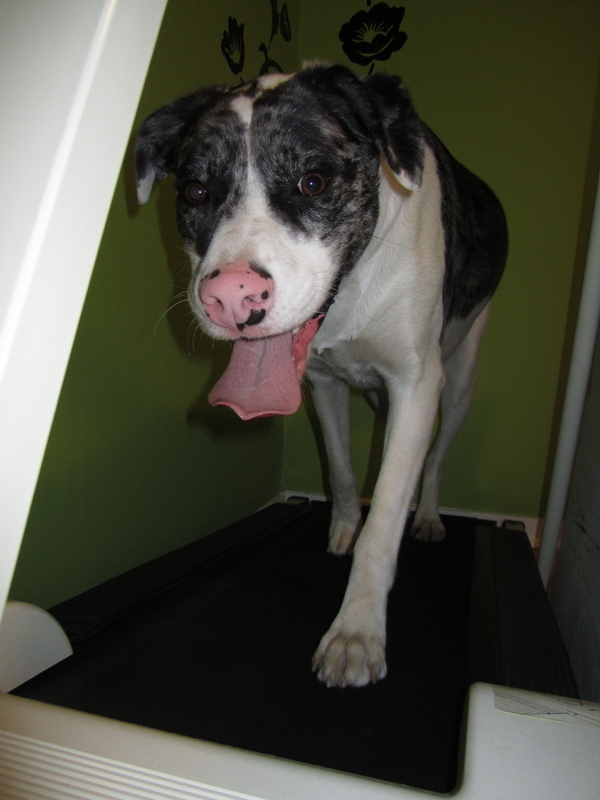 I love the image of Sherman farting while he is on his treadmill! Hilarious!